Showing recent results 2221 - 2235 of 2237 products found. 40-265-302 - Pickering Interfaces Ltd. The 40-265 range consists of 6, 4 or 2 channel modules (this version is the 2-channel, 2k) that simulate the operation of a range of strain gauges making it ideal for testing strain gauge meters and a wide variety of industrial control systems. The range provides a simple way of replacing in house developed sensors with a low cost simulator having excellent performance. The 40-265 uses the same resistor bridge techniques that real life strain gauges are based on, ensuring accurate emulation under all conditions. Each simulator channel includes an independent input for the Excitation Voltage and a bridge output. The Excitation Voltage port can be driven by an AC or a DC source. The bridge circuit includes three fixed resistors and a fourth programmable resistor that can be adjusted over a narrow resistance range with fine adjustment capability and excellent accuracy. The adjustment range provided is sufficient to simulate quarter, half or full bridge circuits. The standard bridge impedances are 350, 1k, 1.5k, 2k and 3k. These modules are extremely simple to use, the variable resistor element can be programmed using a simple resistance call. The module supplies the user with the resistance value required to balance the bridge, and the resistance call to the simulator can be varied above and below this value to simulate extension and compression of the strain gauge resistor. 40-265-106 - Pickering Interfaces Ltd. The 40-265 range consists of 6, 4 or 2 channel modules (this version is the 6-channel, 3k) that simulate the operation of a range of strain gauges making it ideal for testing strain gauge meters and a wide variety of industrial control systems. The range provides a simple way of replacing in house developed sensors with a low cost simulator having excellent performance. The 40-265 uses the same resistor bridge techniques that real life strain gauges are based on, ensuring accurate emulation under all conditions. Each simulator channel includes an independent input for the Excitation Voltage and a bridge output. The Excitation Voltage port can be driven by an AC or a DC source. The bridge circuit includes three fixed resistors and a fourth programmable resistor that can be adjusted over a narrow resistance range with fine adjustment capability and excellent accuracy. The adjustment range provided is sufficient to simulate quarter, half or full bridge circuits. The standard bridge impedances are 350, 1k, 1.5k, 2k and 3k. These modules are extremely simple to use, the variable resistor element can be programmed using a simple resistance call. The module supplies the user with the resistance value required to balance the bridge, and the resistance call to the simulator can be varied above and below this value to simulate extension and compression of the strain gauge resistor. 40-265-102 - Pickering Interfaces Ltd. The 40-265 range consists of 6, 4 or 2 channel modules (this version is the 2-channel, 3k) that simulate the operation of a range of strain gauges making it ideal for testing strain gauge meters and a wide variety of industrial control systems. The range provides a simple way of replacing in house developed sensors with a low cost simulator having excellent performance. The 40-265 uses the same resistor bridge techniques that real life strain gauges are based on, ensuring accurate emulation under all conditions. Each simulator channel includes an independent input for the Excitation Voltage and a bridge output. The Excitation Voltage port can be driven by an AC or a DC source. The bridge circuit includes three fixed resistors and a fourth programmable resistor that can be adjusted over a narrow resistance range with fine adjustment capability and excellent accuracy. The adjustment range provided is sufficient to simulate quarter, half or full bridge circuits. The standard bridge impedances are 350, 1k, 1.5k, 2k and 3k. These modules are extremely simple to use, the variable resistor element can be programmed using a simple resistance call. The module supplies the user with the resistance value required to balance the bridge, and the resistance call to the simulator can be varied above and below this value to simulate extension and compression of the strain gauge resistor. 40-265-206 - Pickering Interfaces Ltd. The 40-265 range consists of 6, 4 or 2 channel modules (this version is the 6-channel, 1k) that simulate the operation of a range of strain gauges making it ideal for testing strain gauge meters and a wide variety of industrial control systems. The range provides a simple way of replacing in house developed sensors with a low cost simulator having excellent performance. The 40-265 uses the same resistor bridge techniques that real life strain gauges are based on, ensuring accurate emulation under all conditions. Each simulator channel includes an independent input for the Excitation Voltage and a bridge output. The Excitation Voltage port can be driven by an AC or a DC source. The bridge circuit includes three fixed resistors and a fourth programmable resistor that can be adjusted over a narrow resistance range with fine adjustment capability and excellent accuracy. The adjustment range provided is sufficient to simulate quarter, half or full bridge circuits. The standard bridge impedances are 350, 1k, 1.5k, 2k and 3k. These modules are extremely simple to use, the variable resistor element can be programmed using a simple resistance call. The module supplies the user with the resistance value required to balance the bridge, and the resistance call to the simulator can be varied above and below this value to simulate extension and compression of the strain gauge resistor. 40-265-306 - Pickering Interfaces Ltd. The 40-265 range consists of 6, 4 or 2 channel modules (this version is the 6-channel, 2k) that simulate the operation of a range of strain gauges making it ideal for testing strain gauge meters and a wide variety of industrial control systems. The range provides a simple way of replacing in house developed sensors with a low cost simulator having excellent performance. The 40-265 uses the same resistor bridge techniques that real life strain gauges are based on, ensuring accurate emulation under all conditions. Each simulator channel includes an independent input for the Excitation Voltage and a bridge output. The Excitation Voltage port can be driven by an AC or a DC source. The bridge circuit includes three fixed resistors and a fourth programmable resistor that can be adjusted over a narrow resistance range with fine adjustment capability and excellent accuracy. The adjustment range provided is sufficient to simulate quarter, half or full bridge circuits. The standard bridge impedances are 350, 1k, 1.5k, 2k and 3k. These modules are extremely simple to use, the variable resistor element can be programmed using a simple resistance call. The module supplies the user with the resistance value required to balance the bridge, and the resistance call to the simulator can be varied above and below this value to simulate extension and compression of the strain gauge resistor. 40-265-304 - Pickering Interfaces Ltd. The 40-265 range consists of 6, 4 or 2 channel modules (this version is the 4-channel, 2k) that simulate the operation of a range of strain gauges making it ideal for testing strain gauge meters and a wide variety of industrial control systems. The range provides a simple way of replacing in house developed sensors with a low cost simulator having excellent performance. The 40-265 uses the same resistor bridge techniques that real life strain gauges are based on, ensuring accurate emulation under all conditions. Each simulator channel includes an independent input for the Excitation Voltage and a bridge output. The Excitation Voltage port can be driven by an AC or a DC source. The bridge circuit includes three fixed resistors and a fourth programmable resistor that can be adjusted over a narrow resistance range with fine adjustment capability and excellent accuracy. The adjustment range provided is sufficient to simulate quarter, half or full bridge circuits. The standard bridge impedances are 350, 1k, 1.5k, 2k and 3k. These modules are extremely simple to use, the variable resistor element can be programmed using a simple resistance call. The module supplies the user with the resistance value required to balance the bridge, and the resistance call to the simulator can be varied above and below this value to simulate extension and compression of the strain gauge resistor. 40-265-204 - Pickering Interfaces Ltd. 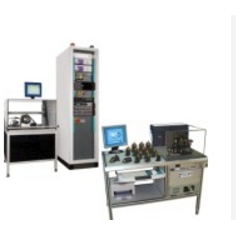 The 40-265 range consists of 6, 4 or 2 channel modules (this version is the 2-channel, 350) that simulate the operation of a range of strain gauges making it ideal for testing strain gauge meters and a wide variety of industrial control systems. The range provides a simple way of replacing in house developed sensors with a low cost simulator having excellent performance. The 40-265 uses the same resistor bridge techniques that real life strain gauges are based on, ensuring accurate emulation under all conditions. Each simulator channel includes an independent input for the Excitation Voltage and a bridge output. The Excitation Voltage port can be driven by an AC or a DC source. The bridge circuit includes three fixed resistors and a fourth programmable resistor that can be adjusted over a narrow resistance range with fine adjustment capability and excellent accuracy. The adjustment range provided is sufficient to simulate quarter, half or full bridge circuits. The standard bridge impedances are 350, 1k, 1.5k, 2k and 3k. These modules are extremely simple to use, the variable resistor element can be programmed using a simple resistance call. The module supplies the user with the resistance value required to balance the bridge, and the resistance call to the simulator can be varied above and below this value to simulate extension and compression of the strain gauge resistor. 40-265-406 - Pickering Interfaces Ltd. The 40-265 range consists of 6, 4 or 2 channel modules (this version is the 6-channel, 1.5k) that simulate the operation of a range of strain gauges making it ideal for testing strain gauge meters and a wide variety of industrial control systems. The range provides a simple way of replacing in house developed sensors with a low cost simulator having excellent performance. The 40-265 uses the same resistor bridge techniques that real life strain gauges are based on, ensuring accurate emulation under all conditions. Each simulator channel includes an independent input for the Excitation Voltage and a bridge output. The Excitation Voltage port can be driven by an AC or a DC source. The bridge circuit includes three fixed resistors and a fourth programmable resistor that can be adjusted over a narrow resistance range with fine adjustment capability and excellent accuracy. The adjustment range provided is sufficient to simulate quarter, half or full bridge circuits. The standard bridge impedances are 350, 1k, 1.5k, 2k and 3k. These modules are extremely simple to use, the variable resistor element can be programmed using a simple resistance call. The module supplies the user with the resistance value required to balance the bridge, and the resistance call to the simulator can be varied above and below this value to simulate extension and compression of the strain gauge resistor. 40-265-016 - Pickering Interfaces Ltd. The 40-265 range consists of 6, 4 or 2 channel modules (this version is the 6-channel, 350) that simulate the operation of a range of strain gauges making it ideal for testing strain gauge meters and a wide variety of industrial control systems. The range provides a simple way of replacing in house developed sensors with a low cost simulator having excellent performance. The 40-265 uses the same resistor bridge techniques that real life strain gauges are based on, ensuring accurate emulation under all conditions. Each simulator channel includes an independent input for the Excitation Voltage and a bridge output. The Excitation Voltage port can be driven by an AC or a DC source. The bridge circuit includes three fixed resistors and a fourth programmable resistor that can be adjusted over a narrow resistance range with fine adjustment capability and excellent accuracy. The adjustment range provided is sufficient to simulate quarter, half or full bridge circuits. The standard bridge impedances are 350, 1k, 1.5k, 2k and 3k. These modules are extremely simple to use, the variable resistor element can be programmed using a simple resistance call. The module supplies the user with the resistance value required to balance the bridge, and the resistance call to the simulator can be varied above and below this value to simulate extension and compression of the strain gauge resistor. 40-265-104 - Pickering Interfaces Ltd. 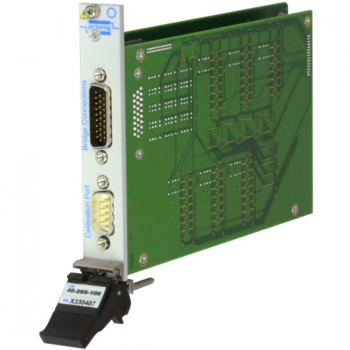 The 40-265 range consists of 6, 4 or 2 channel modules (this version is the 4-channel, 3k) that simulate the operation of a range of strain gauges making it ideal for testing strain gauge meters and a wide variety of industrial control systems. The range provides a simple way of replacing in house developed sensors with a low cost simulator having excellent performance. The 40-265 uses the same resistor bridge techniques that real life strain gauges are based on, ensuring accurate emulation under all conditions. Each simulator channel includes an independent input for the Excitation Voltage and a bridge output. The Excitation Voltage port can be driven by an AC or a DC source. The bridge circuit includes three fixed resistors and a fourth programmable resistor that can be adjusted over a narrow resistance range with fine adjustment capability and excellent accuracy. The adjustment range provided is sufficient to simulate quarter, half or full bridge circuits. The standard bridge impedances are 350, 1k, 1.5k, 2k and 3k. These modules are extremely simple to use, the variable resistor element can be programmed using a simple resistance call. The module supplies the user with the resistance value required to balance the bridge, and the resistance call to the simulator can be varied above and below this value to simulate extension and compression of the strain gauge resistor. 40-265-012 - Pickering Interfaces Ltd.
40-265-402 - Pickering Interfaces Ltd. The 40-265 range consists of 6, 4 or 2 channel modules (this version is the 2-channel, 1.5) that simulate the operation of a range of strain gauges making it ideal for testing strain gauge meters and a wide variety of industrial control systems. The range provides a simple way of replacing in house developed sensors with a low cost simulator having excellent performance. The 40-265 uses the same resistor bridge techniques that real life strain gauges are based on, ensuring accurate emulation under all conditions. Each simulator channel includes an independent input for the Excitation Voltage and a bridge output. The Excitation Voltage port can be driven by an AC or a DC source. The bridge circuit includes three fixed resistors and a fourth programmable resistor that can be adjusted over a narrow resistance range with fine adjustment capability and excellent accuracy. The adjustment range provided is sufficient to simulate quarter, half or full bridge circuits. The standard bridge impedances are 350, 1k, 1.5k, 2k and 3k. These modules are extremely simple to use, the variable resistor element can be programmed using a simple resistance call. The module supplies the user with the resistance value required to balance the bridge, and the resistance call to the simulator can be varied above and below this value to simulate extension and compression of the strain gauge resistor. MotorLine® - MLI-D - M.E.A. Testing Systems Ltd.
*Performs QA testing on 100% of production without compromising line throughput (up to 10 motors per minute), reducing costs of defective products. *Determines acceptability to user predefined PASS/FAIL limits on production lines. *Provides motor performance data, from stall up to no-load, within seconds, including: torque, speed, current, voltage, input power, output power, time, efficiency, direction of rotation.· Provides dynamic performance tests data, including:speed and torque spectrum, speed and torque oscillations, friction torque, friction spectrum,friction output power, cogging torque level.· Motor performance data can be recorded in the system database for comparison and statistical analysis.· Motor power switching is done automatically by the system.· Motors can be tested inside their applications.· Test results are provided graphically and tabulated.· Test reports in PDF and Excel format.· Capability for integration with third party devices, such as hipot & insulation resistance testers.· System is customized to suit specific requirements.· Supports non-contact frictionless sensors. *Low-cost portable unit with all the major motor performance tests of the standard MotorLine® system. *Connects directly to USB 2.0 port. *Performs QA testing on 100% of production without compromising line throughput (up to 10 motors per minute), reducing costs of defective products. *Determines acceptability to user predefined PASS/FAIL limits on production lines. *Provides motor performance data, from stall up to no-load, within seconds, including: torque, speed, current, voltage, input power, output power, time,efficiency, direction of rotation. *Provides dynamic performance tests data, including: speed and torque spectrum, speed and torque oscillations, friction torque, friction spectrum, cogging torque level, back EMF. *Motor performance data can be recorded in the system database for comparison and statistical analysis. *Motor power switching is done automatically by the system. *Motors can be tested inside their applications. *Test results are provided graphically and tabulated. *Test reports in PDF and Excel format. 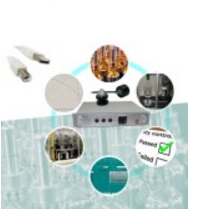 *Capability for integration with third party devices, such as hipot & insulation resistance testers. *Supports non-contact frictionless sensors.